The images and texts gathered below take us a bit far from the usual subjects developed by Fimarkets. 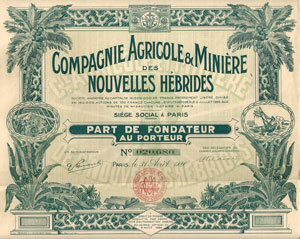 But we could not resist the opportunity and the pleasure to take you to this not-so-distant time: a time when stock and bond certificates were printed on paper and often beautifully illustrated and when, to receive a dividend, you had to clip them (hence the term "coupon") to bring them to your banker. The history of the companies proposed at the time to investors also reveals a value system that has become more and more foreign to us: unshakable faith in progress on one hand, unscrupulous exploitation of natural as well as human resources on the other hand. 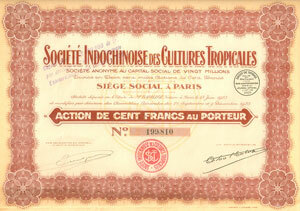 The study and collection of old stocks is called scripophily. There are many Web sites dedicated to this subject on the Web, mainly merchant ones. 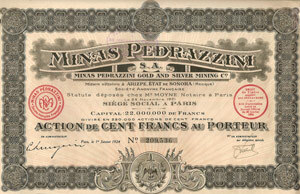 If you are interested in French stocks such as the ones presented here, you may want to visit this French-speaking site, a cut above the rest, which provides real information: www.scripophilie.com. 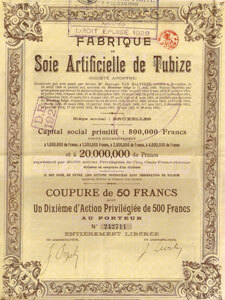 The old French stocks and coupons presented below have been scanned from a private collection. These are original shares that are not for sale. We have looked for historical data to tell you the story of the companies. The Internet sources related to each stock are listed. Give honor where honor is due: here is the sadly famous Russian loan, which more than a million French investors subscribed to... until payments stopped after the Russian revolution. 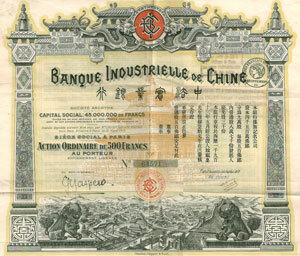 The Industrial Bank of China was created in France in 1913 to finance the French industrial expansion in China and in the Far East. The statuses indicate the purpose of the company: "All banking and finance operations, generally speaking, in all countries. And especially bringing into play the existing and future agreements with the government of the Chinese Republic". It disappeared in 1921 after a bankruptcy. The initiators of the project were the Berthelot brothers: one, Philippe, was sub-director for Asia at the French Foreign Office, the other, André, was a deputy and representative of the Baron Empain. The management of the bank was given to A.J. Pernotte, who was sentenced to three years of jail for his involvement in the bankruptcy of the bank. He wrote a book where he related the history of the bank: "Why and how the Industrial Bank of China was founded: its difficulties, its enemies, politics and finance". The New Hebrides was the colonial name of a Melanesian archipelago at the east of Australia. They remained an Anglo-French condominium until 1980. They are now the independent state of Vanuatu. The Agricultural and Mining Company of the New Hebrides is one the large companies created starting from 1925 to exploit the land property of the New Hebrides settlers. The companies employed local labor force as well as many Vietnamese people who were taken from Indochina, another territory under French control. The work conditions were especially inhumane. 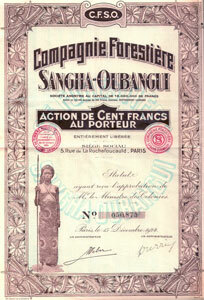 The Sangha-Oubangui Forest Company is one those large industrial plantations of the French Equatorial Africa, the creation of which was eased by the system of colonial concessions. In 1910 it was in control of the whole Aka land, that is to say 42 millions of acres. Theses plantations mainly exploited rubber, coffee and cocoa. As often in colonies, the exploitation of these plantations came along with violence and coercion against the population. The French writer Louis-Ferdinand Céline, whose name was still Louis Destouches at the time, worked for the Sangha-Oubangui Forest Company as supervisor and then plantation manager from March 1916 to February 1917. He violently denounced colonialism afterwards in Journey to the End of the Night. After a journey to Congo in 1925, French writer André Gide also engaged in a public fight against the injustices of the colonial system. He relates how rubber plantation workers, accused of not delivering the required quantities, were condemned to walk for hours in the blazing sun, carrying heavy wood beams, until one of them collapsed, dead. The Company of the Mozambique was created in 1891, at the same time as two other companies, through concession of the state of Portugal. 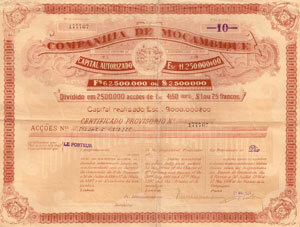 Portugal granted it the exploitation of the resources of a large central area of the current state of Mozambique, then a Portuguese colony. The company held exclusive rights to develop the economy of the territory that it had been granted. It could even directly collect taxes. In exchange, it had to develop the infrastructures: create a railway line, develop the postal service (the Company of the Mozambique emitted about 300 different stamps, much sought-after by collectors! ), maintain public services and pay a fee to the Portuguese state. 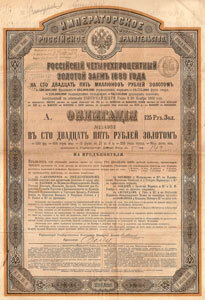 In addition to emitting shares and stamps, the company even emitted banknotes! The achievements of these companies at the expiration of their mandate in 1929 were disappointing. Their policy was mainly aimed at enriching the settlers and the Portuguese state at the cost of the development of local infrastructures. This factory was established in 1900 with the purpose of exploiting new patents to manufacture a fiber similar to silk from cellulose. This factory was the first and most important one in Belgium. Up to 5500 people worked for it. The company created many subsidiaries in the world. Going through mergers and selling, the company kept operating until 1980 when it went bankrupt. 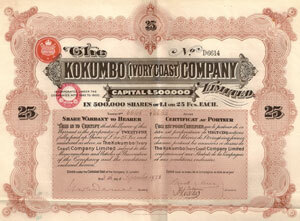 The purpose of this English company was the purchase and exploitation of a property in the district of Kokumbo, Ivory Coast: gold mining, agricultural and industrial exploitation. 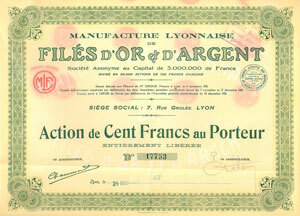 The Lyons Factory of Gold and Silver Threads became Mérieux-MLF before finally being apparently taken over by BBA, supplier of civilian and military garment accessories and uniform items. This company, founded by Luigi Pedrazzini, a native from Ticino (Swiss), exploited several gold and silver mines in Arizpe in the state of Sonora, Mexico. Among these mines, the mine of "Las Chispas" (cristal) contained a particularly remarkable vein of polybasite, a silver ore. Luigi Pedrazzini built his fortune in mining and later came back to live in his native area, which still holds a collection of minerals that belonged to him. The sisal is a plant native to Mexico, a member of the Agavaceae plant family. Sisal provides fibers used for making ropes and brushes. Working sisal was hard, dirty and dangerous to health because the air of the factory was saturated with dust. 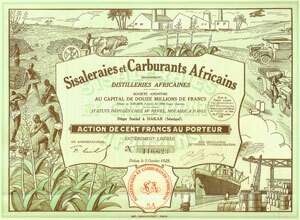 The purpose of this company founded in 1925 was the study and promotion of farms in the French tropical colonies. This company has been managed by Edmond Giscard d'Estaing, father of the former French president. The purpose of this company was: exploitation in Russia of blast furnaces, forging mills, steel plants, rolling mills, wire-drawing mills, wire-nail works, engineering factories, iron denaturation factories, as well as forests and mining veins. It became a Russian company in 1916. The copper mines of Plakalnitza in Bulgaria were already exploited in 3000 B.C. 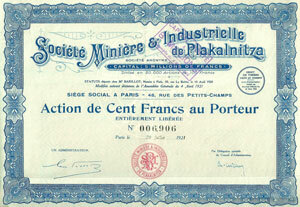 This French company remained active until World War II. Laurium or Laurion is a Greek town located about 43 miles southeast of Athens. This town was famous in antiquity for its silver mines - a major source of revenue for the city of Athens, and for the fate reserved to the slaves who worked there. The Laurium mines were exploited until the 20th century by French and Greek companies, not for silver but for lead, manganese and cadmium. 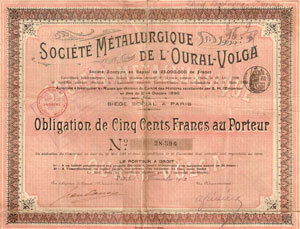 In the 19th century, two companies, the Company of the Laurium Factories and the French Laurium Company, thus shared the exploitation of the subsoil of this region, employing up to 9500 workers. 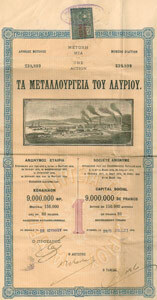 The Company of the Laurium Factories, holding a concession from the Greek Government, also built and operated a railroad in Attica.